To compute the asymptotic (complex) resistance of this infinite circuit Feynamn instructs you look at a single iteration and to summarise the rest in some black box with resistance R.
Note that in this limit the frequency w dropped out. So far the Feynman lectures. But there is one curious thing: Although we have been adding only capacitors and inductances which have purely imaginary resistances and no Ohmic (real) resistance, nevertheless, the limit is real! How can this be true? When you think about the physics you should be even more irritated: Neither capacitors nor inductances do any work and only Ohmic resistance produces heat. By adding together elements that do not produce heat. After meditating this fact for a while one settle with the explanation that one might say that the energy is carried down the infinite circuit and never returns and thus is gone and might be considered heat. But this is not really convincing. So we should better study the maths to some more detail. 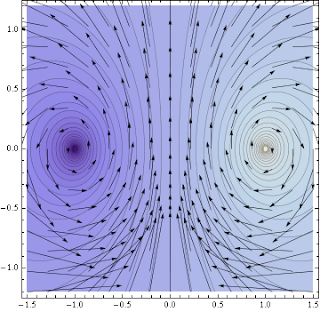 What we have done was to consider a sequence of resistances and computed the possible fixed points of this iteration. If the resistance converges it certainly will converge to a fixed point. But who tells you it really converges? We can see (either from the formula or the plot) that for purely imaginary R we will always stay on the imaginary axis and flow to complex infinity! Without Ohmic resistance we will not flow towards the fixed points. 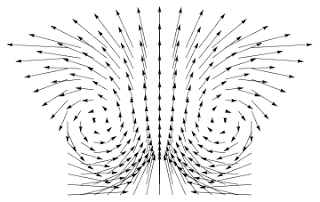 But even if we start off slightly off the imaginary axis we do not spiral in to one fixed point as one might have thought: The vector field is holomorphic and thus Hamiltonian. Therefore there is a conserved quantity (although right now I am too tired to compute it).